'Gusuku Site and Replated Properties of the Kingdom of Ryukyu' is the generic name of the remains of Ryukyu Kingdom which are scattered mainly southern part of Main Island of Okinawa. The following properties are listed as world heritage. 'Gusuku (or Gushiku)' means Castle in Okinawa. At present, the Chinese character for castle (romanized as Shiro or Jo) is generally used to write the term Gusuku. However, for example, the outward appearance is quite different when compared to what are termed 'castles' on the Japanese mainland. More than 200 Gusukus are said to exist in the islands from north (Amami Region) to south (Miyako-Yaeyama Region). Many existing Gusuku retain vestiges of the ancient Ryukyus in their appearance, symbolized by stonewall enclosures and castle ramparts. After the passing of the Neolithic Shell Mound Period, the people of the Ryukyus began to create an agrarian society. Ironware tools for agriculture were produced and the cultivation of grain spread. This era is referred to as the "Gusuku Period." During this period it is believed that reserves of provisions became possible, resulting in an increased population and stability of people's lifestyles. In each region of the Ryukyus, powerful feudal clans called Aji (also known as Mataha or Anji) gained power and competed for hegemony. 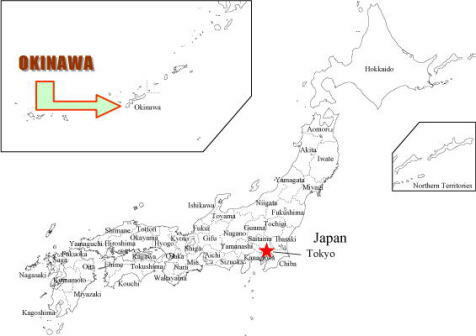 This kind of rivalry and shifting of alignment resulted in powerful Aji lords concentrated on the main island of Okinawa. The'Sanzan (literally 'three mountains,' also known as the 'three kingdoms') Period' arrived. The Aji chieftains constructed Gusuku to maintain their own power and prepared for the rivalry. These were said to be the first of the Gusuku castles. There were a variety of Gusuku; well-ordered masonry types suitably termed fortresses as well as small places for prayer and areas used for the ancient tradition of open-air burials. At present the meaning and role of the Gusuku continue to be debated. Shuri Castle is in the eastern part of Naha City. It used to be the capital of Ryuku Kingdom. The castle offers a complete view of Naha from an elevation of 120 - 130 meters. With an unrivalled view and blessed with abundant water, these favorable conditions for castle construction made for the largest scale Gusuku construction in the prefecture. There are four gates on the outer walls. The inner walls hold nine gates, and these are 6 - 10 meters in height, made of cut stone and joined with the masonry walls. In the caslte, there is Seiden (main building) which is the biggest wooden construction in Okinawa. There are many other facilities which beared the function as the nerve center of the Ryukyu Kingdom. Outside of the castle, there are remains which are the essences of the artistic Ryukyu construction, for example Shurei Gate, Sonohyanutaki Stone Gate, Engaku-ji Temple, Benzaiten-do, Enkanchi pond, Ryutan, etc. 12 minutes walk from Shuri Station.